MARY ELIZABETH F. BRICE, O.D. 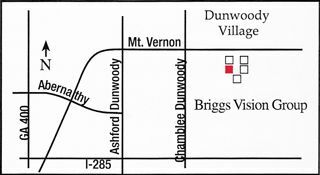 Our family eyecare practice was established in Dunwoody by Dr. Judson Briggs in 1984. Over the years, Briggs Vision Group's mission has been the same... provide superior eyecare through innovative technology, a passion for excellence, and unmatched quality and service for each patient that walks through our door. Dr. Briggs’ areas of expertise include hard to fit contact lenses, ocular disease diagnosis and management, and family eyecare.